A million thanks to our guest host, Dennis Calero, who made up wild characters with the wonderful kids at Mount Sinai this week! 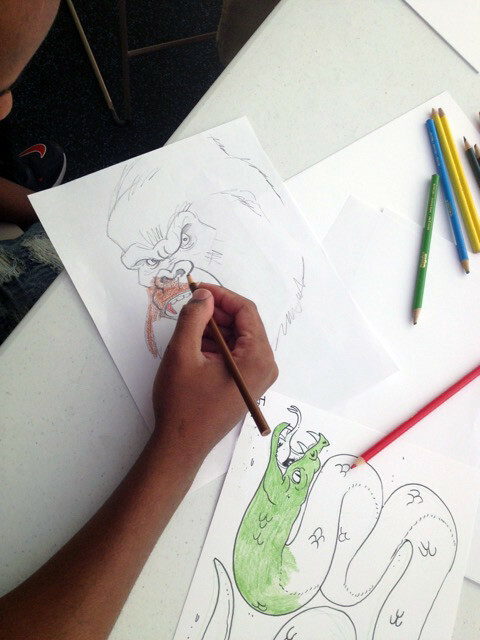 The kids at New Alternatives created the most daring, inventive animated shorts this weekend! They learned the entire process, designed characters, created stories and made them animate all in the space of an hour and a half. Our respect for these talented kids is boundless. Thank you to our NAC Event Director, Lisa LaBracio, for bringing her TED Ed animatin’ expertise to the table and to our volunteers Ray Alma, Drew Dernavich, Stefano Imbert and Tim Savage for sharing their time and mad skills and to the wonderful staff and families of NAC for being the supportive village we all need. We held court with two regal young artists at Mount Sinai tonight! The girls, ages 5 and 7, donned paper crowns and joined us on stage for our KidZone TV show, where Elana Amity and Dennis Calero taught how to draw owls and Smurfs and Super Woman. Thank you, noble ladies, for helping make this show such a special one! Tonight we celebrated National Lollipop Day on our KidZone TV show! The lollipop was patented in 1931 by George Smith, who named the sweet after his favorite racehorse, Lolly Pop. So we drew horses and lollies and at the request of the kids, we also drew lots of unicorns! 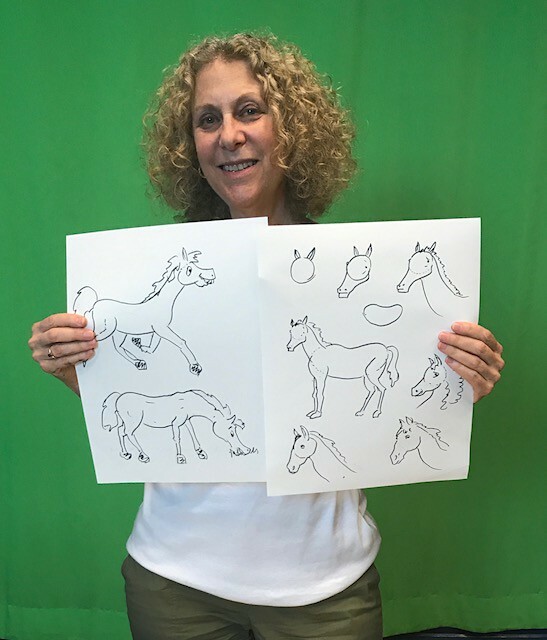 Thank you, kids, for drawing with us, to the staff of Mount Sinai for always helping make sure that the show goes on, and to our Event Director, Elana Amity, who lovingly coordinates and hosts every one of our shows. 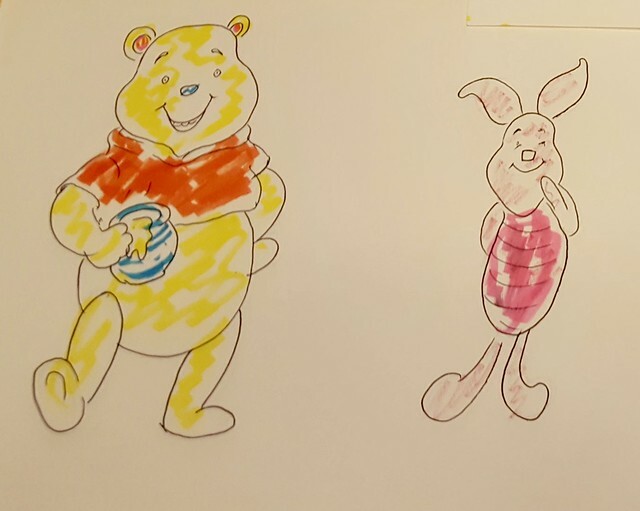 It was our great joy to draw with the kids at St. Mary’s Hospital this past weekend. Despite dealing with severe, life-limiting challenges from burns to cerebral palsy, these kids always reach out to us with warmth and enormous enthusiasm as we create together. 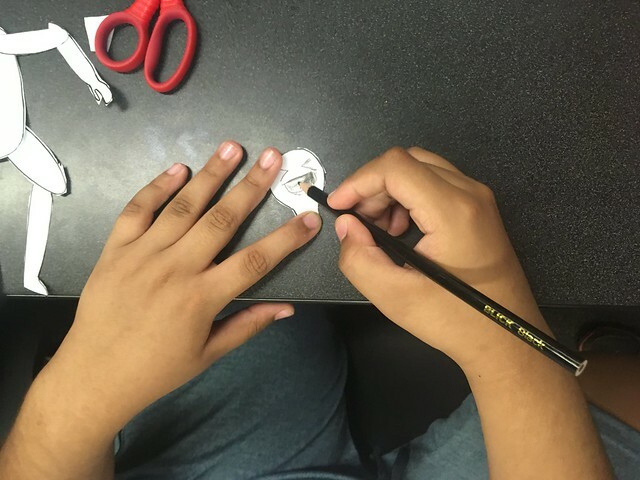 Art truly can form a beautiful bond and we are grateful to these children for sharing that connection with us. On this lovely day the kids helped us make super psyched super heroes, grumpy Tweety birds and great big gruff gorillas. 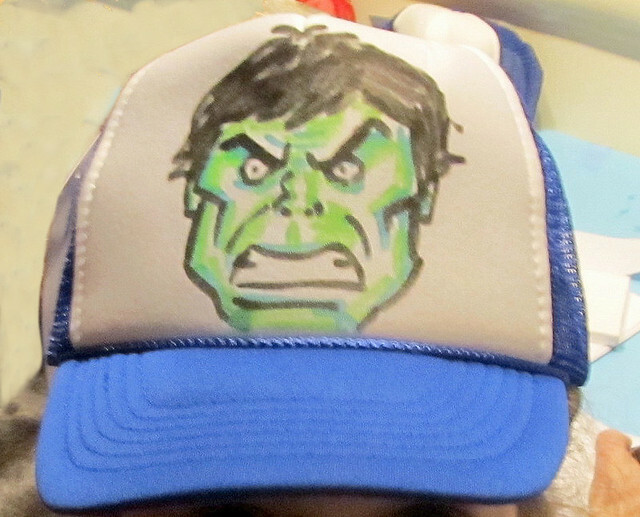 Many of the children also got their caricatures drawn, thanks to new Ink Well member, Fred Fassberger. So happy to have you along, Fred! Thanks to the rest of our trusty Ink Well gang: Pedro Delgado, Joyce Pedretti, Tim Savage, Joe Vissichelli and our dear Event Director, Ray Alma, for making it all possible. Thanks also to the ever reliable and kind St. Mary’s staff, and most of all to these wonderful, brave kids. Keep drawing, friends. What a joy to make characters dance and flip and dive into our animation event with the New Alternatives kids! We made 3 sets: a theater stage, an underwater world and a sky then the kids added their own buildings, super heroes and super stars that danced, swam and flew through the scenes. 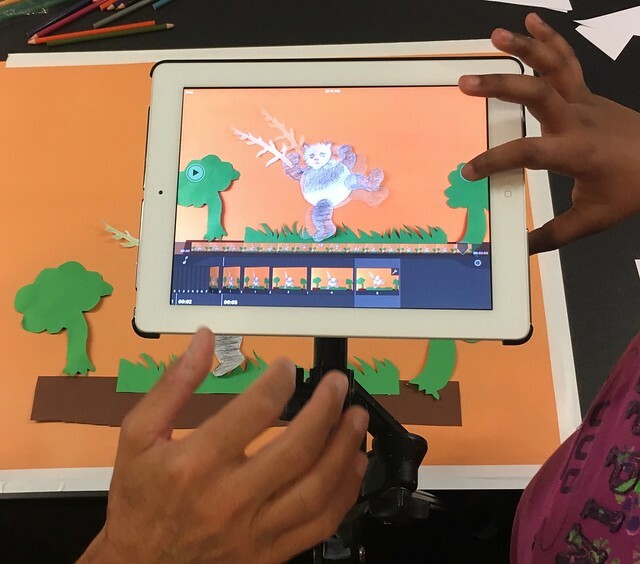 Our favorite moment of the night was when the shyest, quietest boy in the bunch pulled us aside to say, “you made me really happy today.” Many kids also asked us how they could make animations at home so we are thrilled that they caught the animation bug too and will continue to create on their own. Thank you, kids, for your boundless imagination and energy, to the NAC staff and our Event Director, Lisa LaBracio, for organizing such an amazing time and to our trusty and beloved volunteers: Elana Amity, Pedro Delgado, Barbara Garrison, Marty Macaluso, and Tim Savage..
Tonight we drew sunny beach scenes to celebrate the first day of summer! Event Director, Elana Amity, started with beach-going SpongeBob, Snoopy and friends. Then a little girl named, Abby, called in to help volunteer, Pedro Delgado, draw a dolphin and unicorn sharing some ice-cream! Thanks, kids, for the great collaborations. We’ll see you again next month on our KidZone TV Show! We celebrated the Coney Island Mermaid Parade with the kids at Bellevue Hospital by creating sea-themed dioramas! After crafting mermaids, merboys, and their underwater worlds, the kids got their own mermaid socks that transformed them into mer-versions of themselves! Thank you to volunteers: Ray Alma, Elana Amity, Sergei Aniskov, Barbara Garrison, Dayna Gonzalez, Henry Hilaire, Stefano Imbert, and Ellie Rahim who made this such a fun event to dive into. We are truly impressed by the resilient, talented teens we met at NY Foundling’s career fair. Many of these young adults have spent their whole lives in foster care, but their eyes are on the future: they spoke with us earnestly and with open minds about how they may explore their passions as they move into the working world. We discussed careers spanning from advertising and graphic art to fine art, teaching and animation. It was a joy to see our life’s work spark an interest in this next generation. Thank you, NY Foundling teens and staff for having us and to our volunteers who brought their wide range of expertise to the table: Jane Archer, Todd Broder, Joan Chiverton, Stefano Imbert and Lisa LaBracio. 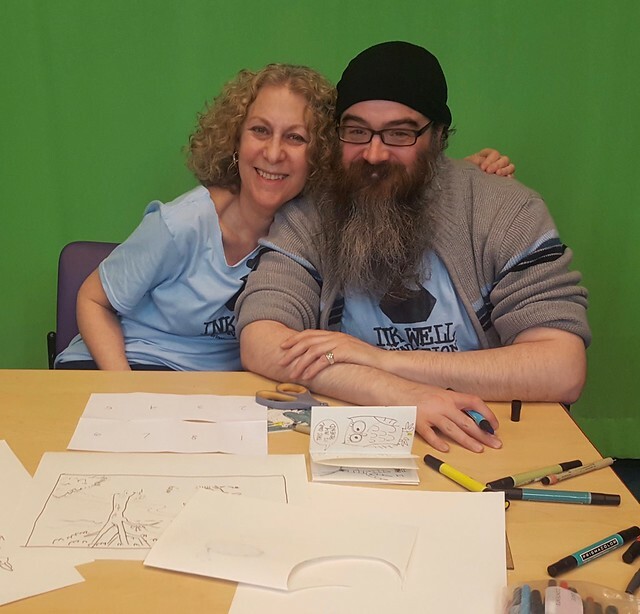 We had a very jolly night, drawing St. Patty’s Day characters with the kids at Mount Sinai Hospital over our live “KidZone TV” show. The kids can now text us with their requests as we draw and boy did they ever! Elana Amity showed how to draw a leprechaun with a pot of gold and the kids instructed her on how to decorate his clothes and even how to magically transform his pot into a pumpkin! Then Pedro Delgado minted the leprechaun’s gold coins with imagery that the kids requested. It was quite touching: one child asked Pedro to draw a hospital, another asked for a mother and child. We held the drawings up close to the camera so the kids could see the details and we let them know that (as always) all the art would be left there for them to keep. It’s always a mix of laughter and quiet, moving moments when we draw with the children at Gilda’s Club. Many of these kids have recently lost a parent to cancer and you can feel the weight within them, but creating something together brings warmth and connectivity that we hope can help to heal. We want to thank these kids for being brave enough to share their art and time with us. Thank you to Gilda’s Club NYC for this special, supportive place and to our Ink Well volunteers who helped the kids make the most fantastic character flip books in town: Lisa LaBracio, Elana Amity, Joyce Pedretti, Sergei Aniskov, Pedro Delgado, Ray Alma, Elizabeth Winter, and Peter de Seve, special thanks to our Event Director, Franz Palomares for setting everything up and running the show. 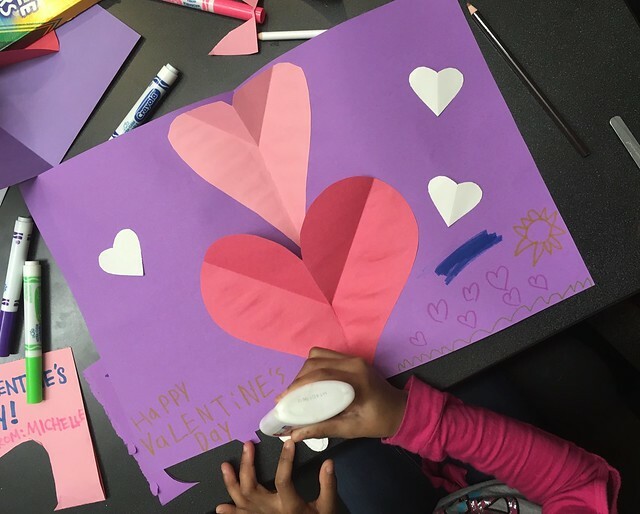 Our NAC Event Director and superstar TED-Ed animator, Lisa LaBracio, taught us how to make Valentine’s Day pop-up cards tonight! The kids projected their love with beating hearts, hopping bunnies, blooming flowers and wild tigers that leapt from the page. Then they filled their cards with thoughts of togetherness and gratitude, reminding us what this holiday is truly about. Thank you very much to our volunteer artists: Joan Chiverton, Pedro Delgado, Stefano Imbert and Joyce Pedretti! 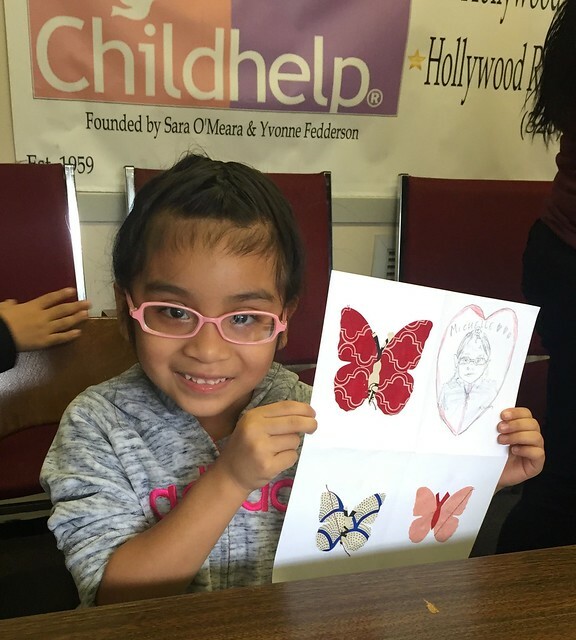 We were honored to celebrate another year with our beloved kids at Bellevue by making holiday cards together. We are very proud of these children for drawing the many things they are grateful for, even as they feel the difficulty of being away from loved ones during this holiday time. We got to innovate a little by making window cut outs in the cards, thanks to volunteer, Sangjun Chon’s idea: the kids drew Santa inside chimneys, elves under Christmas trees, and put just the gifts they wanted inside their presents. At the end of the night we gave each child their own sketch book and crayon set so they could continue drawing on their own. Thank you, kids, for your earnest hard work and for bringing so much warmth to a chilly December evening. Thanks also to our Event Director, Jane Archer, who led our trusty crew of volunteers: Elana Amity, Sergei Aniskov, Sangjun Chon, Dayna Gonzalez, and Elizabeth Winter. Tonight we celebrated the autumnal equinox! Elana Amity gave a lesson on how to draw bulldogs, chihuahuas and one famous beagle (Snoopy) enjoying the last day of summer at the beach while thinking of pumpkins and falling leaves. John Stevens (first timer!) spoke about his own experience growing up with dyslexia and how he was able to turn it into a gift by drawing cartoons: Steven is now ambidextrous, which he showed by drawing two people with both hands at the same time. He also can write upside down and backwards like Leonardo Da Vinci! 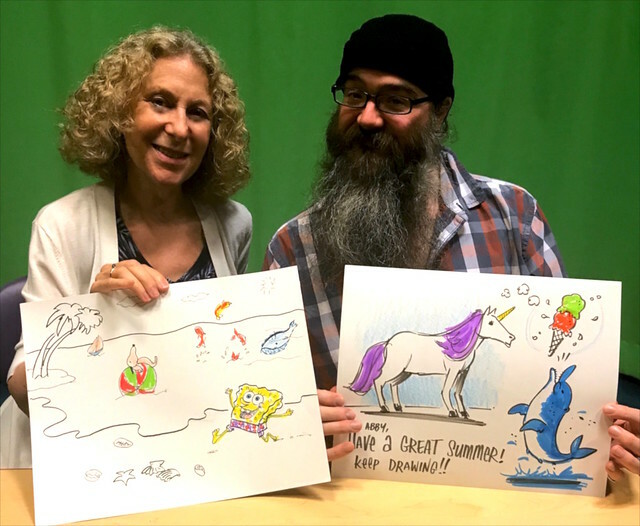 Thank you so much, John and Elana, and to the lovely children who drew along with us on our live call-in Kid Zone TV show. We were touched by the several children who shared their stories of losing a parent to cancer or about how it feels to be going through cancer as we drew together tonight. It made us even more grateful for what a special place Gilda’s Club is. Together we drew in the zoo and lots of portraits too. The kids invented all kinds of creatures and we helped make some of their drawings into stand up 3D character cut-outs. There were lots of birthdays today and we were happy to help make birthday cards too! After the event, we all got together to bid our beloved Director at New Alternatives, Nathan Schreiber, and long-time volunteer, Oded Naaman, farewell as they move on to Chicago and Israel respectively. Thank you, kids and volunteers: Ray Alma, Elana Amity, Dayna Gonzales, Stefano Imbert, Lisa LaBracio, Oded Naaman, Franz Palomares (Director of GC Events), Julia Sarcone Roach and Maria Scrivan.